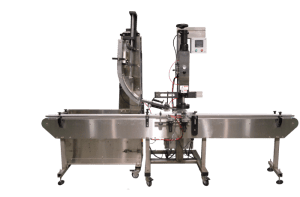 Single-head automatic chuck screw capper and plastic-top cork applicator system will sort and apply caps and corks to rigid containers at nominal speeds of 30-40 containers per minute. 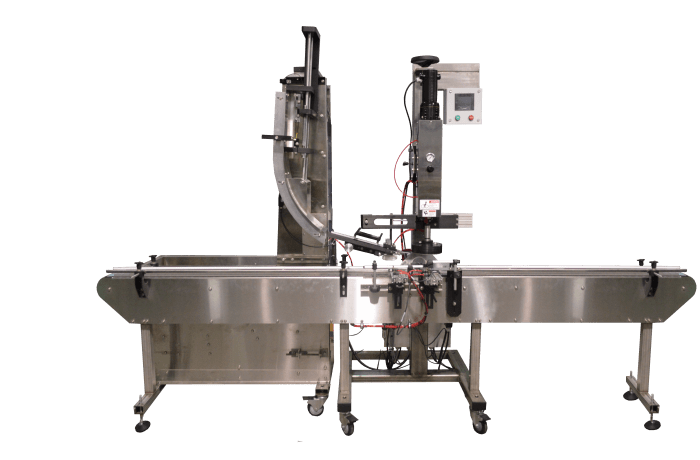 The machine will automatically sort and feed plastic top corks or screw caps from a bulk hopper and deliver them to the escapement and cork-cap applicator. The applicator will transfer the cork/cap from the chute escapement on to the container and insert the cork in to the cork retainer, pressing the cork to its position on the neck of the container. The screw cap will be placed and torqued accordingly on to the container. The containers will be automatically indexed and centered under the application station for container to cork alignment and released after the cork has been applied.